Do you ever feel a little unsure about what all those letters mean in your personality type? You’ve taken the “test” or indicator and you’ve gotten a 4-letter code, but you keep hearing people throw around words like “Ni” or “Se” or “Fi” or “Te”. Perhaps you’re trying to memorize your cognitive function stack but keep getting lost on whether your inferior function is thinking or feeling, or what KIND of thinking or feeling it is. I get it. All this jargon related to personality type can be confusing. The more you learn the more there is to know! That’s why I’m making a hand-dandy (yes, I’ve watched blues clues too many times) post that shows you how to figure out your function stack (or anyone else’s) with a few simple tricks…no memorization required! What are your preferences? When you got your four-letter type code, each of those letters indicated that you preferred one mode of mental processing over another. For example, if your type was ESFP this would mean you preferred Extroversion over Introversion, Sensing over Intuition, Feeling over Thinking, and Perceiving over Judging. But What do the Preferences Mean?! If you’re an Extravert, your energy flows outwards towards people and things in the environment. You gain energy from action and interaction with the outer world. If you’re an Introvert, your energy flows inwards towards thoughts and ideas inside yourself. You gain energy from contemplation and inner reflection. If you’re a Sensor, you are focused more on the concrete world around you and what you can trust through your senses. You are realistic, practical, and detail-oriented. You collect facts and trust tangible evidence. If you’re an Intuitive, you are focused more on the theoretical, abstract, and symbolic. You look for underlying connections and meanings and are more focused on “the big picture” and impressions than details and facts. If you’re a Thinking type, you make decisions using logical criteria. You try to “step out” of a situation to determine what the facts are, what is true or false, and what makes sense. You try not to get personal in your decisions, because it could make you biased or illogical. If you’re a Feeling type, you make decisions based on what aligns with your values or what will impact people positively. You “step in” to a situation to determine how it will affect people, and what the significance or impact will be. If you’re a Judger, then you prefer to have closure in the outer world. You like to have things organized, planned out, and decided. You “think out” your decisions externally in many cases. You usually work before you play. If you’re a Perceiver, then you are more comfortable with a flexible lifestyle. You are adaptable and like to wait to make decisions till you have as much information as possible. You are good at mixing work with play. The preferences mentioned above only scratch the surface of who you are in relation to your personality type! To really get in-depth, you’ll want to know what your cognitive function “stack” is. These functions tell you more detail about how you think and make decisions. Your dominant function is your most preferred and what gets you into a state of “flow”. You are usually most comfortable and in your element when you are using this function. If you’re an extrovert, this is the function is focused on the outer world and the reality that exists outside of yourself. If you are an introvert this function is focused on your inner, subjective world and the impressions you gain from inside. Your auxiliary function is your second-most preferred. This function supports the dominant function and promotes balance and personal growth. If you’re an introvert, this is the function that is focused on the external world. If you’re an extravert, this is the function that is focused on the inner, subjective reality. Your tertiary function is your third most-preferred function. It provides relief and is a way you like to “play” and be creative. It’s not as advanced or developed as your top two functions, but you have a fondness for it and enjoy engaging in it when you’re not stressed. Your inferior function is your fourth most-preferred function. It tends to be a weakness and is something you may be self-conscious about showing the outer world. It’s something you aspire to be good at, but may continually feel you have a hard time mastering. Using this function can cause you stress or be exhausting. 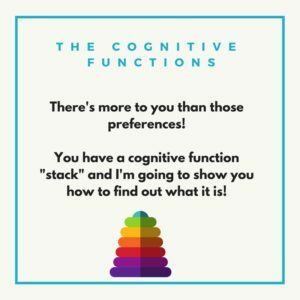 How Do I Find Out What My Cognitive Function Stack Is? 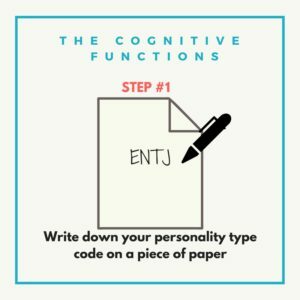 First, write down your personality type code on a piece of paper. Or else think about it in your head (if you’re good at holding onto information!). Next, remember that there are four mental processes: iNtuition, Sensing, Thinking, and Feeling. Based on your type code, which processes do you prefer? If you’re an ENTJ, then you prefer NT. If you’re an ISFP then you prefer SF. Take the processes you DON’T prefer and write them below the processes you do prefer (like I’ve shown in the image above). For example, if you’re an ENTJ, write “SF” below the “NT” in your type code. If you’re an ISFP, write “NT” below the “SF” in your type code. Now what’s your orientation to the outer world? You’ll know this by looking at the last letter of your type code. 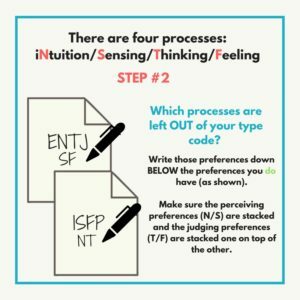 If the last letter in your type code is a J then the T or F preference in your code is extraverted. To remember this, put a lower case “e” next to the T or F in your four-letter type code as shown in the image above. In the examples shown, the ENTJ has Te and the ISFJ has Fe. Now if the last letter in your type code is a P, that means that your T or F preference is introverted. You’ll want to put a lower-case “i” next to the T or F in your four-letter type code, as shown above. 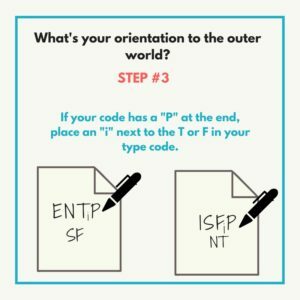 You can see that the ENTP uses Ti and the ISFP uses Fi. This next step is a little more complex. If you’re a J type, then you’ll want to put a lower-case “i” next to the N or S in your four-letter type code. Remember those non-preferred preferences? 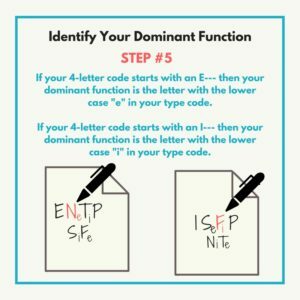 You’ll want to put an “i” next to the T or F not in your type code (for example, in the image above the ENTJ has “Fi” in the non-preferred section). 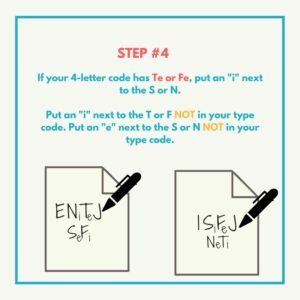 You’ll also want to put a lower-case “e” next to the S or N not in your type code (for example, in the image above, the ISFJ has “Ne” in the non-preferred section). If you’re a P type, then you’ll want to put a lower-case “e” in the N or S section of your type code. For example, the ENTP has an “e” next to “N” to show that he uses “Ne”. Take a look at those two non-preferred preferences you wrote below your type code. Put an “e” next to the T or F not shown in your type code. Put an “i” next to the S or N not shown in your type code. Now we get to identify your dominant function! Woo hoo! You’ve made it this far and you’re almost done. If your 4-letter code starts with an E—- then your dominant function is the letter with the lower case “e” in your type code. For example, with ENTP the dominant function is “Ne”, or Extraverted Intuition. If your 4-letter code starts with an I— then your dominant function is the letter with the lower-case “i” in your type code. For example, with the ISFP the dominant function is “Fi”, or Introverted Feeling. Now we can figure out your whole stack! 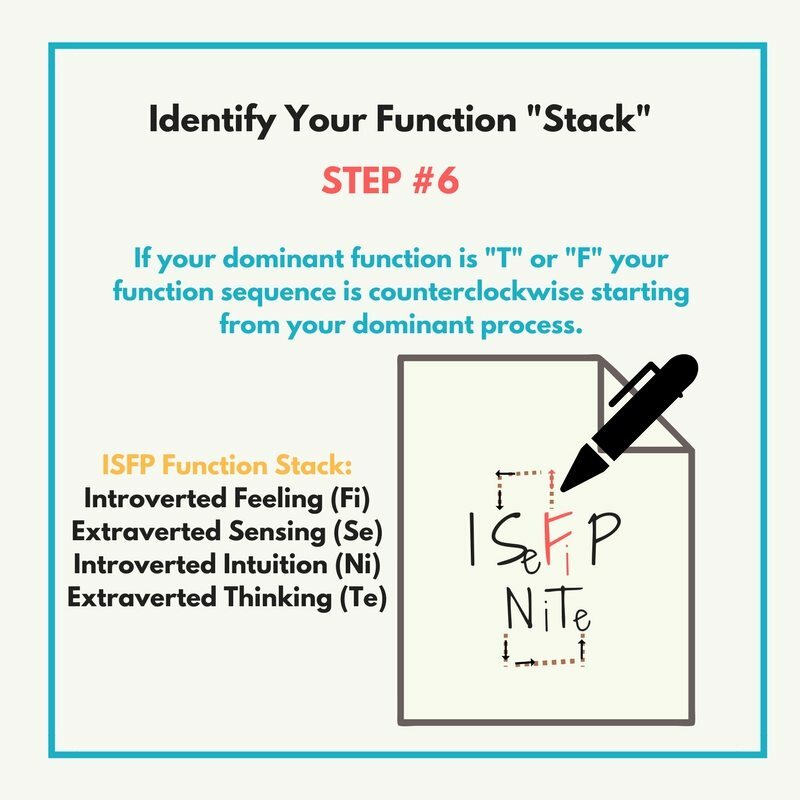 If your dominant function is T or F, then the sequence or order of your functions is going to go in a counter-clockwise direction from the T or F. For example, the ISFP’s “stack” goes from Fi to Se, Ni to Te. If your dominant function is S or N, then then the sequence or order of your functions will go in a clockwise direction from the S or N preference. 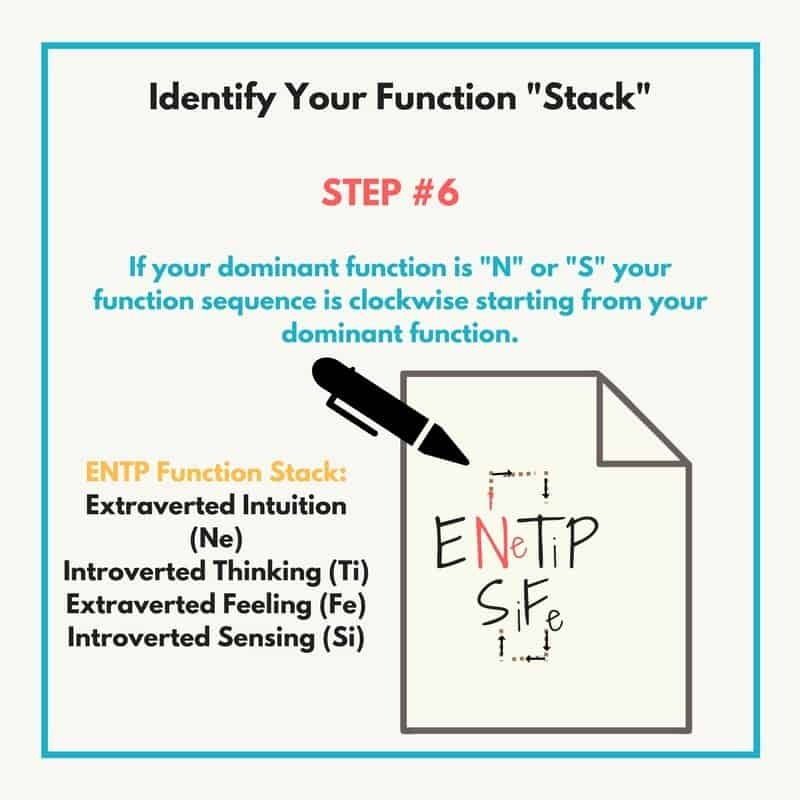 For example, in the picture above you can see that the ENTP’s “stack” is Ne,Ti,Fe,Si. But I’m still confused about the letters! So you’ve got a sequence of letters now, but you’re not sure what all those letters mean. That’s okay! The capital letter in your type code will always stand for a mental process (Sensing, Intuition, Thinking, Feeling) the lower-case letter tells us which direction or attitude it has (introverted or extroverted). So Si = Sensing/introverted. But What’s the Difference Between Introverted and Extraverted Functions? Introverted functions are oriented towards the inner, subjective world. They are usually more internalized and more intensive. For example, introverted feeling is also called “subjective” feeling. It’s about individual values and ethics. Extraverted functions, in contrast, are oriented towards the outer world. Extraverted functions are usually more extensive than intensive and more obvious and externalized. For example, extraverted feeling focuses primarily on the emotions/values/needs outside one’s self. Foresees implications, conceptualizes new ways of seeing things, and gets an image or sense of the future or of a profound hidden meaning. Has a sense of certainty about what will happen and is energized by transformational visions of how something will develop. Receives “flashes” of insight and is tapped into universal symbols. Reviews past experience to compare and contrast what is to what has been. Clarifies and accumulates detailed information and uses a methodical approach to complete projects. Preserves vivid sense-impressions, remembering exactly how something once was and it’s impression upon one’s self. Notices changing patterns and is attentive to alterations and modifications. Very practical and detail-oriented. Sees numerous theoretical possibilities, connections, and relationships between things in the outer world. Reads between the lines and explores potential possibilities. Has an ever-shifting pattern of ideas and insights triggered by the current experience. Sees everything in the context of how it relates to everything else. Nothing stands alone or is disconnected. Experiences and notices all the concrete details in the outer world in real-time. Is highly attuned to changes in the environment and scans for visible reactions and relevant data. Adapts and changes with the existing environment and tunes into the moment to maximize the experience and respond. Focuses on facts and is extremely realistic. Analyzes, categorizes, and organizes internal principles and truths to try to figure out how the world works. Notices the fine distinctions between things and creates categories and sub-categories to classify everything in the most accurate, precise way possible. Looks at many sides of an issue to find inconsistencies; always searching for the most extreme form of truth or accuracy. Likes to learn for the sake of learning. Considers what is important and what one’s own subjective values are. Notices inconsistencies between actions and espoused values, and as a result is very attuned to what is authentic or inauthentic. Highly aware of what feels right or wrong to one’s self and strives to live in accordance with that. Continually weighs the situational worth or importance of everything and expresses values through action rather than words most of the time. Applies logic, order and efficiency to the outer world. Easily notices inefficiency or flaws in a system or plan and is skilled at streamlining processes. Expresses thoughts directly, and is skilled at critiquing, directing, and organizing. Takes decisive action and focuses on objective logic and data to make decisions and create plans. Appreciates empirical evidence and dislikes paradoxes. Connects and empathizes with others while responding to their values and feelings. Monitors the environment for morale or disharmony and tries to create an environment where people feel happy and welcome. Discloses personal details to establish rapport. Is usually very aware of social niceties, good manners, and expectations of others. “Absorbs” the emotions of other people in real-time to sense how they’re feeling. Does Your Type Code Make a Little (or a Lot) More Sense? What type would answer mbti questions in a way that indicates how they want to be rather than how they are?